The Paris Agreement offers a dynamic but durable framework  for increasing climate action over time. One of the sources for this dynamism is the “global stocktake “ – a moment every five years for all countries to pause and account for what has been achieved so far, and what must still be done, to achieve the goals of the Paris Agreement. The global stocktake is a key element in the ambition mechanism of the Agreement; it will provide countries with the basis for strengthening their actions and submitting new national climate commitments in the two years following each successive global stocktake. In other words, the global stocktake is the engine of the Paris Agreement, constantly moving us forward and enabling increased ambition of national climate commitments  over time. The first full global stocktake will occur in 2023, but will be preceded by an initial stocktaking exercise in 2018 (known as the facilitative dialogue ). This facilitative dialogue will provide an opportunity for countries to reflect on collective progress already made and opportunities to take further action prior to submitting new or enhanced NDCs ahead of 2020. Because countries are to rely on information generated by the stocktake to update and enhance their successive national climate commitments, its scope is broad, requiring “an assessment of collective progress towards achieving the purpose of the Agreement and its long-term goals.” In laying out the parameters for the stocktake, Article 14 of the Paris Agreement requires that it include mitigation, adaptation and the means of implementation and support (finance, technology transfer and capacity building). In addition, the Paris Agreement mandates that it be undertaken in a comprehensive and facilitative manner, in light of equity and the best available science. Although the Paris Agreement establishes the basic framework for the global stocktake, countries still have several important decisions  to ensure the stocktake operates effectively. These discussions are ongoing, and will be taken up again in May during the United Nations Framework Convention on Climate Change negotiations session held in Bonn, Germany. Below, we run through some of the key questions countries will face as they design the global stocktake. What is the purpose of the Paris Agreement and its long-term goals? The Paris Agreement aims to “strengthen the global response to the threat of climate change, in the context of sustainable development and efforts to eradicate poverty” through long-term goals addressing mitigation, adaptation and finance. Assessing collective progress against each of these goals comes within the scope of the global stocktake. Mitigation: “holding the increase in the global average temperature to well below 2 °C above pre-industrial levels and pursuing efforts to limit the temperature increase to 1.5 °C above pre-industrial levels”.1 The Agreement also calls for reaching net-zero greenhouse gas emissions in the second half of the century . Adaptation: “increasing the ability to adapt to the adverse impacts of climate change and foster climate resilience and low greenhouse gas emissions development, in a manner that does not threaten food production”; The Agreement also establishes a global goal for adaptation to enhance adaptive capacity, strengthen resilience and reduce vulnerability to climate change. Finance: “making finance flows consistent with a pathway towards low greenhouse gas emissions and climate-resilient development”. How can the global stocktake assess collective progress? Assessing collective progress towards adaptation can be a challenge, given the locally-determined, context-specific nature of national adaptation goals and action. Countries need a range of approaches  to monitor and evaluate their adaptation progress. Methods and procedures for tracking adaptation may already be in place through a country’s efforts in producing National Communications or in implementing a National Adaptation Plan (NAP) process. Guidelines are currently under development for the communication of adaptation efforts under the Paris Agreement, and these will provide important inputs to the stocktake. NAP Technical Guidelines , which provide guidance on reporting, monitoring and review, are a useful resource to support the development and institutionalization of methods that can also be usefully applied to monitoring adaptation progress. Outlining a basic, common framework for aggregating national adaptation progress to the global level is a key task for the global stocktake. Such a framework could ensure that national adaptation actions are categorized in ways that connect to elements of the global goal, and countries with similar national goals (related to adaptation planning processes, for example or outcomes in specific sectors) could be grouped to understand progress and gaps nationally and globally. Ideally, the framework will also have clear links to related global monitoring efforts such as the Sustainable Development Goals  and the Sendai Framework for Disaster Risk Reduction . Aggregating national adaptation progress in this way will also enable other important adaptation mandates of the global stocktake (notably recognizing the adaptation efforts of developing countries and supporting the enhancement of implementation of adaptation action). And it would be critical to ensure that the use of such a framework is directly linked to methodologies, forthcoming from the Adaptation Committee and LEG, on reviewing the adequacy and effectiveness of adaptation action and support (see finance section below). The finance goal of the Agreement is broad, encompassing all investments, both public and private. Assessing collective progress towards this goal is a huge undertaking by any account, but an important one, since investments will either fuel the transition to a sustainable economy or lock in a costly and inefficient trajectory incompatible with a safe climate. The mitigation and adaptation goals of the Paris Agreement provide some indication of what a viable “pathway towards low greenhouse gas emissions and climate-resilient development” would look like, but Parties will need to consider how to assess whether finance flows are “consistent” with such a pathway at a global level. A growing number of researchers , NGOs , and governments  are grappling with these challenging questions. Because of its expansive scope, it will be important to draw on data sources that cover all types of finance flows. The Paris Agreement does identify some specific requirements for assessing support in the global stocktake. It states that one of the reasons for countries’ reporting, as set out in the transparency framework in Article 13, is “to the extent possible, to provide a full overview of aggregate financial support provided, to inform the global stocktake.” Given the lack of agreement on what counts as climate finance  and the different accounting processes used, this is more complicated than simply adding together what individual countries currently report. In Paris, countries agreed to develop modalities for accounting of financial resources provided and mobilized through public interventions. This process, taking place in the Subsidiary Body for Scientific and Technological Advice (SBSTA), must develop clear, consistent and workable modalities to allow an accurate aggregation of climate finance flows for the global stocktake to consider. The global stocktake must also “review the adequacy and effectiveness of adaptation and support provided for adaptation.” The focus on adaptation support – the Agreement doesn’t specify a comparable adequacy and effectiveness review for mitigation support – could enable particular attention to adaptation finance, especially given less funding has historically gone to adaptation  compared to mitigation. In designing the stocktake, Parties, with guidance from the Adaptation Committee and the LEG, will need to determine what constitutes adequate and effective support for adaptation. 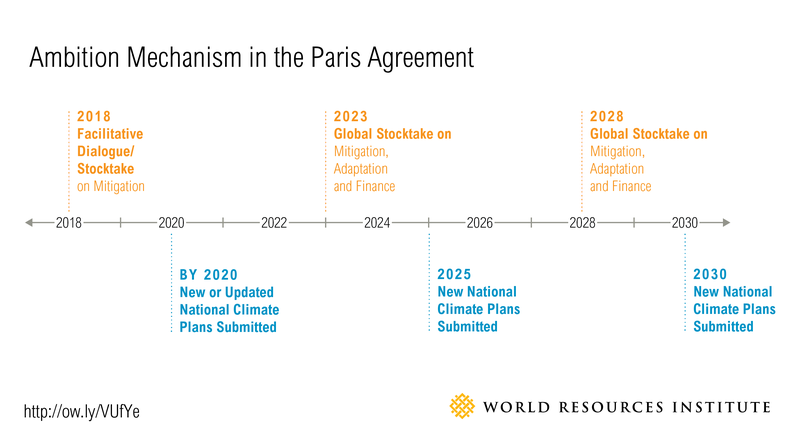 Lastly, the accompanying decision to the Paris Agreement calls on the CMA to set a new collective quantified finance mobilization goal from a floor of $100 billion per year prior to 2025. Parties could decide that the global stocktake, which is mandated to consider “information on mobilization and provision of support,” assesses progress towards this goal. How will the global stocktake be conducted and who will be involved? To ensure balance across each element of the global stocktake, it could be conducted in three distinct streams - mitigation, adaptation and means of implementation and support (finance, technology transfer and capacity building). A technical phase conducted throughout the year, involving the generation of synthesis and summary reports and expert meetings, could then feed into a concluding, multilateral political moment during the relevant meeting of the Parties to the Paris Agreement (CMA) for that year (held in conjunction with the COP). Opportunities could be provided for civil society to provide technical inputs, share views and participate as observers throughout both technical and political phases to ensure an open and inclusive process. How can the global stocktake inform future national climate commitments? The global stocktake should enhance implementation and drive increasing ambition  from all Parties over time. To do this well, the global stocktake must be forward as well as backward-looking. Provide the information countries need to identify opportunities for enhanced action. By highlighting key technological shifts, specific sectoral opportunities to increase climate action and opportunities to enhance collaboration, countries can have a clear roadmap for how to enhance their ambition in the next round of national climate commitments. Inform the delivery of support and technical assistance needed to realize these opportunities. The global stocktake must also identify and unlock potential barriers to implementation, and connect countries with the support needed to overcome them and facilitate such enhanced ambition. Ensuring the global stocktake can inform the delivery of support and technical assistance through the Financial Mechanism, Technology Mechanism and UNFCCC bodies undertaking capacity building is critical. Ensuring alignment between the global stocktake and efforts of non-state actors, including cities and businesses, will be crucial to maximizing its influence. Non-state actors can be a source of information, technical analysis, external assessments and support for delivering on national climate commitments . How will relevant information be collected? scientific inputs (i.e. the IPCC report on 1.5C). Based on the information already available, the Secretariat could be charged with identifying potential gaps in information. Some of these gaps could be filled by information from other UN organizations (such UNEP, which produces the Emissions Gap  and the Adaptation Finance Gap reports ) and civil society. It is important that the information available for the global stocktake be comprehensive, but not burdensome. Information must be presented in a clear and digestible manner, not just for their international counterparts but also the wider community. In some cases, information could be provided by other international organizations (such as multilateral development banks and the International Monetary Fund) to ease the reporting burden on Parties. There are precedents for the synthesis and summary of information. The UNFCCC Secretariat has already been mandated to aggregate annual global emissions levels in 2025 and 2030 that are estimated to result from implementation of current national climate commitments. Similarly, the Standing Committee on Finance has a mandate to produce a Biennial Assessment and Overview of Climate Finance Flows . Compilation and synthesis reports have also been compiled by the UNFCCC Secretariat for national greenhouse gas emissions, broader national communications on climate actions, and adaptation priorities. These reports should provide the basis for inputs to the global stocktake. How can the global stocktake link to other processes under the Paris Agreement? To achieve its purpose, the global stocktake must work closely with other key processes under the Paris Agreement. Namely, the enhanced transparency framework for action and support  and the mechanism to facilitate implementation of and promote compliance with the Paris Agreement. The transparency framework will provide the information for the global stock, including national reports of greenhouse gas emissions, progress in implementation, climate impacts, finance provided and mobilized through public interventions, and support needed and received. The relationship could also work the other way, though; the experience and outputs of the global stocktake should also identify additional information needs or areas to improve the transparency or clarity of information to facilitate the assessment of collective progress. Ensuring a two-way street between the transparency framework and global stocktake will be crucial for the effectiveness of the overall regime. The global stocktake is how the long-term goals of the Paris Agreement will be achieved. But we must move forward now if we want to achieve those long-term objectives. Getting these finer details right is vital to the success of the Paris Agreement. 1 See references in Article 3 and Article 4.1 explicitly acknowledging that the purpose of the Agreement is set out in Article 2 and the Agreement’s long-term temperature goal is also set out in Article 2.